The Musicians from Marlboro concerts are always a great way to catch a glimpse of young artists who are on the rise—many of whom are already recognized for their musical creativity and emotional depth. Their tours introduce many of them to Philadelphia audiences for the first time. The Marlboro concert on November 13 features an artist who grew up in Philadelphia, but studied at the New England Conservatory of Music. 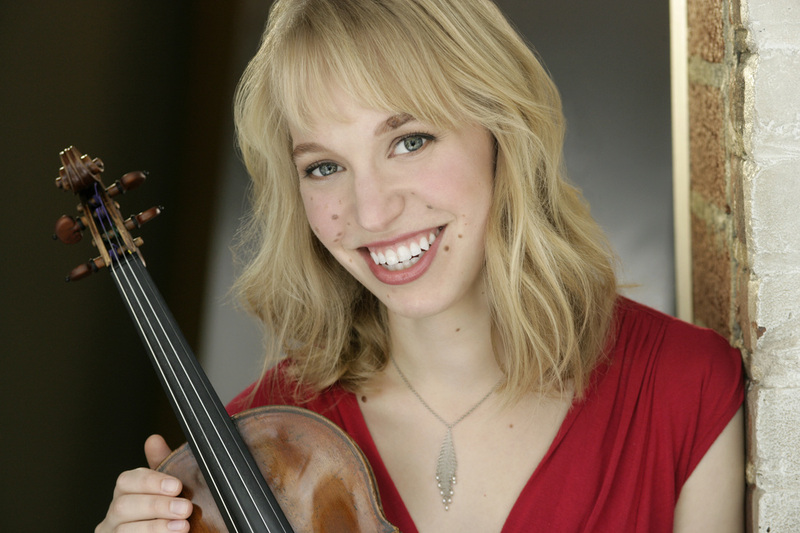 We sat down with violinist Robyn Bollinger to discuss her time at Marlboro and a special project she has launched this year. Erik Petersons: You will be appearing with the Musicians from Marlboro concert on November 13th. How did your experience studying at Marlboro shape you as an artist? Robyn Bollinger: Marlboro contributed to my career in a very special way, allowing me to more fully develop myself as an artist by experiencing three truly remarkable gifts as a member of the Marlboro community: the gift of time, the support and encouragement of a strong musical community, and through inspiring dedication to excellence. The gift of time: At Marlboro, the basics of life (namely food, lodging and scheduling!) are taken care of, leaving us musicians free to spend our time working on music. In addition to collaborative rehearsals and numerous opportunities to perform in concerts with a variety of talented and experienced musicians, I have used my summers at Marlboro to plan musical projects, wrap my head around the year to come, learn new pieces, and practice, practice, practice. Having this gift of time has shaped each of the years that has followed a Marlboro summer, and I know I will still enjoy the effects of that gift on my music-making for years to come. There is a special musical community that forms at Marlboro each summer, and it is an enormous privilege to count myself as a member of that community. Marlboro is a place where many of the classical music world’s top artists come to play—and lucky me to get to join! It is inspiring to spend time with my peers, some of whom are doing either very similar things and some also very different things, and it is heartening, interesting, and validating to talk about some of our struggles during the year and remember that we’re not alone in our musical journey. It is also so important and reassuring to get to spend time with some of the more established members of our community who have already been through all the things many of us are just now experiencing, whether it be career shifts, relationships, professional dry spells and big successes. These amazing role models share with us how they have handled their own careers and what they have learned. I carry this community support with me all year, and thankfully there are Marlboro family members in just about every port! Finally, everything about the music at Marlboro is excellent—and it is so good, healthy, and challenging to be held to that high standard. At Marlboro we all push each other and encourage each other, and I always leave Marlboro a better musician than when I arrived. Knowing that I can reach that standard of excellence is incredibly empowering, even away from Marlboro—and there is nothing like the feeling of knowing you have done your absolute best. EP: You’ll be performing next to Soovin Kim, one of your former violin teachers. How did he influence your playing and the way you approach music? RB: Neither Soovin nor I can remember exactly when I started studying with him, but I was probably 11 or 12, so it’s fair to say he has been a huge influence for me! I credit my technique to Soovin—we spent many hours on scales and arpeggios, and they totally paid off. I hope I have some of the clarity and vividness that I think of in Soovin’s playing, and like him I’m always asking for more from myself. But I think the most important thing I learned from Soovin was to always look for the heart of the music, to really search for the character and essence of each piece, and then to make informed, logical, natural musical decisions. Whether it’s a Paganini Caprice or Beethoven Concerto or a Bartók Quartet, every piece should be played to the best of what it is, and it is our job as artists to represent that ideal. EP: You are in the middle of a special project entitled, CIACCONA: The Bass of Time. Tell us about this project and the inspiration behind its development? What story do you hope to tell through this music? RB: Growing up in a traditional musical family, I have always been interested in expanding the classical music concert experience. As a teenager embracing technology along with my generation, I wondered if there was a way to make classical music performances more stimulating. I also noticed that the concerts I enjoyed most were those when I felt I had a relationship with either the performer, the composer, or even the music itself. In college, using the idea of technology helping to explore relationships and classical music, I created a multimedia recital project called “Project Paganini,” centered on Paganini’s infamous 24 Caprices. It was such a hit that I decided to pursue another multimedia project, this time focusing on the legendary Bach Chaconne. In 2016, I was awarded at $100,000 Leonore Annenberg Arts Fellowship to create CIACCONA: The Bass of Time. The project encompassed a CD, a DVD, and finally a 2018 multimedia recital tour of this original program, featuring works of Biber, Bach, Bartók, and Berio. In the program I weave together recorded narration, animated historical images, spoken monologues, and live musical performance to tell the story of the ciaccona form throughout violin history. My hope was that this updated model would provide my audiences with ample information and historical context using contemporary media while simultaneously encouraging them to approach the music on a personal level, giving them more to see and more to hear. I’m pleased to say the project has received favorable reviews in such respected media outlets as the New York Times, Boston Globe, and The Boston Musical Intelligencer, and I’ve received widespread encouragement from audiences across the country. It is so exciting and rewarding to work so hard to create something, and then to know that it made a difference for someone—that is the best reason to be a musician! EP: Tell us about your violin that was made by Samuel Zygmuntowicz. How long have you had it and what characteristics do you love most? RB: I am lucky to play on this violin, and not just because one of the top violin makers in the world made this instrument. It was finished in February of 2017, and I started playing it in May of the same year. It is on loan to me from a private donor, and I’m very grateful to have the opportunity to use it. It is an incredible violin. I joke that playing this violin is like driving a really fast car! It’s a powerful instrument, with a bright, clear tone, and plenty of core to the sound. (So, playing over an orchestra is no problem!) Remarkably, though, it retains lots of character in quieter moments too. I find it is quite sensitive and delicate when I go really soft. It’s fun to see how quickly I can go back and forth from powerful to fragile, and it’s a rare violin that can do both. EP: Having grown up in Philadelphia, what are some of your favorite places around the city? RB: As a kid, I loved getting sushi at Shiroi Hana or a big salad at Marathon Grill, and the almond croissants at Bluestone Cafe were the treats that my parents never knew about. But by far my favorite place in Philadelphia is David Michie Violins on Locust Street, right next to the Curtis Institute. David is an old family friend, and I trust him completely with my instruments (or anything else, for that matter). I love sneaking up to the second floor and practicing in his instrument showroom, or even just sitting in the workshop and smelling the fresh instrument varnish—there’s nothing like good friends and a polished violin! EP: What are you currently reading (or read recently)? RB: I finished two books recently, both very different. One was “The Buried Giant” by Kazuo Ishiguro—it’s a thoughtful, poignant tale about memory and searching, set in post-Arthurian England. Then on a plane recently I read “Noir” by Christopher Moore. It was a fantastical melodrama about a bartender in 1940s San Francisco and the outlandish trouble he finds, from tropical snakes and the mob to a new girlfriend and a government-protected extra-terrestrial alien. Now I’m in the middle of “Ender’s Game” by Orson Scott Card. So far it’s about a child prodigy warrior, and I’m pretty sure he’ll have to save the world from aliens in a hundred pages or so. Robyn Bollinger will perform with the Musicians from Marlboro on Tuesday, November 13 at 7:30 pm at the American Philosophical Society. For tickets and information, visit the concert page. For more information about Ms. Bollinger, visit her website.